Cardiff City are one of two clubs with a Double Gameweek 34 but, like those backing Brighton and Hove Albion assets, any Fantasy managers investing in the Bluebirds’ players would have been left disappointed by their initial returns on Saturday. Burnley all but ensured their Premier League safety with a 2-0 win over Neil Warnock’s side, who now face the Seagulls at the Amex on Tuesday night. We run the rule over the Welsh side’s performance and look ahead to their trip to Sussex in the Scout Notes article below. While owners of Glenn Murray (£6.3m) et al would have been left crushed by Brighton’s abysmal display against Bournemouth on Saturday, there were encouraging signs in Lancashire that the second game in the Seagulls’ Gameweek 34 double-header could prove more fruitful by way of FPL returns. Cardiff visit the south coast on Tuesday night having conceded six big chances to Burnley at the weekend, with only Watford allowing more gilt-edged opportunities when Premier League sides are filtered by their last six matches. More pertinently for those Fantasy managers who own the likes of Murray and Shane Duffy (£4.8m), the Bluebirds are looking particularly suspect in the air. Eight of Burnley’s 14 chances were headers on Saturday, meaning Cardiff have now conceded more headed opportunities than any other top-flight club when filtered by their last half-dozen games. No Premier League team has allowed more attempts from set plays in that time, either. Both of Chris Wood‘s (£6.3m) goals were headers, the first coming from a Dwight McNeil (£4.4m) corner after half an hour. Wood then doubled Burnley’s lead in stoppage time when another McNeil cross bobbled up into his path via touches from Bruno Ecuele Manga (£4.4m) and Neil Etheridge (£4.7m). There were other chances from dead-ball situations, too, with Wood hitting the post in the first half before Ben Mee (£4.6m) tested Etheridge with a 76th-minute header. 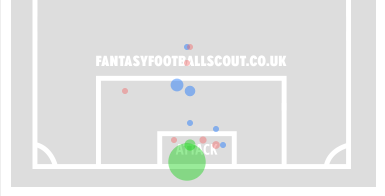 The below graphic shows where Burnley’s chances came from; all eight around the six-yard box were headed opportunities. Even from open play the chances came, with Ashley Westwood (£4.6m) spurning two excellent one-on-one opportunities and Ashley Barnes (£5.7m) unable to convert when attempting to round Etheridge. The fact that Cardiff pretty much have to beat Brighton on Tuesday in order to keep their survival hopes realistically alive would certainly seem to bode well for an open game and Warnock’s side were not without their chances either. Harry Arter‘s (£4.9m) curling effort clipped the top of Tom Heaton‘s (£4.8m) crossbar and Junior Hoilett (£5.0m) ballooned a presentable chance over in the second half, while Cardiff had three penalty shouts after the interval – one of which was actually awarded as a spot-kick before Mike Dean overturned the decision. We can perhaps expect to see Oumar Niasse (£5.0m) back up front in midweek after Kenneth Zohore (£4.6m) flopped on a rare start, while Victor Camarasa (£4.5m) was the not as effective as part of a midfield three rather than a “number ten” and didn’t register a single shot or indeed touch in the Burnley box. As Cardiff’s penalty-taker, of course, Camarasa would have had the chance to register his third goal in five matches had Dean not made a U-turn on the aforementioned spot-kick award. My lads should surround the referee really, they should get round him; [Burnley] had three lads in his ear straight away. Can I say I’m lost for words? The linesman gave it, the fourth official told me Mike [Dean] didn’t see it and yet Mike must have seen something because he’s gone over and told the linesman that it’s hit a part of his body so it can’t be handball. It’s baffling really. I’m so gutted for my players. I thought Darren [Cann] made the right decision but I think Mike has talked him out of it. I thought the lads were super, especially in the second half and our fans were also fantastic. They’re a great bunch and I can’t fault any of them, but we were punished and it’s hard playing Burnley when they’re 1-0 up because it’s difficult to get into the flow. At half-time, I told the lads that we can play better than we had and if we moved the ball quicker and got into their box – we could win the match, but it’s frustrating when one thing after another goes against you. I think in the first half we were really good, the game should have been done. We had a brilliant chance from Woody when he hits the post, a good goal from Woody and Westy has two one v ones. And then in the second half, credit to Cardiff they threw caution to the wind and almost went 2-4-4 and got the ball forward earlier. The ball was coming in from everywhere and I thought the resilience of the team was important because they had the upper hand without a doubt. Despite the excellent FPL form of McNeil and Wood, Burnley’s assets will likely be in short demand given that they face Chelsea, Man City, Everton and Arsenal in their remaining four fixtures. Fantastic, he’s a real talent. His calmness at the end [for Wood’s second goal] to cross it into a dangerous area, his calmness before that to dribble out of trouble. He’s a really good player and he can only mature. I’m pleased for him, for the work he puts in. There’s other parts of his game today weren’t as good as he can be but two goals, you want strikers scoring, him and Barnesy have been scoring. Really pleased with them. Dyche also confirmed that he thinks Phil Bardsley (£4.2m) “will be right this week” after missing his second successive game with a gashed leg. Burnley XI (4-4-2): Heaton; Lowton, Tarkowski, Mee, Taylor; Hendrick, Westwood, Cork, McNeil; Barnes, Wood. Cardiff City XI (4-3-3): Etheridge; Peltier, Morrison, Manga, Bennett; Gunnarsson, Arter (Reid 80′), Camarasa; Hoilett (Mendez-Laing 73′), Murphy, Zohore (Niasse 78′). Cardiff have conceded more headed attempts than any other team. Don’t get my Duffy hopes up after I’ve already accepted this particular blow! I am debating between these 2 captains next week. Thoughts? Wolves form a bit worrying for me... hopefully they’ll be better with 2 home games. But I wouldn’t want to captain Jota that’s for sure. Salah could be a good pick. I’m gambling on Deeney personally, as I’m way off the pace and fancy a differential pick. Don't forget Duffy has a double, too. van Dijk and Robertson have more points than any FPL striker. Are we playing this game wrong? If you don't follow the template on here then more often than not you will be ridiculed. I quite like it when people approach the game differently be it with differentials, chip use, captaincy etc. Liverpool defence has been over 100% EO almost all season - so I think we are playing right. I meant in terms of captaincy. I guess captaincy we are looking for explosive returns whereas Liverpool defence are consistent performers. Robertson is highest scoring defender with 186 points. They're fantastic differential options but they have never been the outright best captain option. Sterling, Mane, Salah, Hazard and Aguero beat them for PPG. I've had them since the start too, but never really considered capping either of them. Sealings higher on midfielders unless you get lucky. Not the first time my triple pool saves my gw. you think VVD is a better choice than spurs on a double GW then? Vardy and Jota out, Mane and Deeny in for a hit? Keep and pray Liverpool don't do too well. What are Vardy owners doing? He’s got 1 more decent fixture before they turn for the worse, and of course no DGW. And if selling, for whom? Keeping for two more. Arsenal at home is precisely his kind of opposition. Brighton are looking more like the team that came from the Championship, going back to the Championship, the longer the season goes on. 2-0 Brighton win with Duffy and Dunk goals - one time? I'd get them tattooed on each arse cheek if that happened. I'm concerned with going for a City/Liverpool asset whilst the CL is in full swing, at least on GW38 we'll know who needs what, and if the title is on the line, Aguero, Sterling, Salah, and Mane will all play 90 minutes for sure. Likewise a punt on Rashford, Auba is they need something for top four, could also pay off against weaker opposition. B if you don't still have BB. Otherwise E.
Probably his last home game, against a tired/rotated Watford team. Would you do Aguero Pogba/Eriksen to Deeney Sterling + ££ ITB to get Salah in 36? Yeah, seems the smart choice... just hurts having had Sterling most of the time on WC but then swapping to Aguero really late on. Looking to replace Siggurdson. Better to bring in Deulefeu or Mane this week? id probably do it in GW36. Which one is better for GW35? People will be celebrating tomorrow when Brighton keep a CS. Just shows how fickle people are. His EO is less than 100% so you want him to score well unless you are my ML rival who is the only one not to have Duffy C.
In other news is it worth a -4 on valery for the double? You lot still confident for your BB with BHA and SOU assets? Yeah, well I'm confident they won't get beaten 5-0 by Cardiff at least. Regardless of how they do, they've allowed me to get six attackers at over £8.5m each (plus Vertonghen), so yes. Also Triple captain Sterling or Aguero ? Why are you asking us, you probably got more points this week than everyone else on this page combined! That’s why I’m wondering if I Should be covering the double weekers or sticking with current players with nice fixtures. No f***ing around, all gunz blazing. Yep. But can see Spurs scoring with the pace of Son and Lucas. I can see Sterling getting a rest this game week with all of the other best attackers/mids playing. Mahrez has been used quite a lot in games against big sides. Sorry but Wouldny class that line-up as juicy! No offence. I found this interesting. Football in Istanbul. We are run by Mafioso style Governance and nobody does it better than the Turks. You see Erdogan's bodyguards pummel protesters when he visited the States? Maybe they will start selling Journalist kebabs supplied by fresh culls from the Saudi Embassies. Boly, purely cuz of price. Have Aguero Deeney and Jimenez and anyone of them could haul with the fixtures for the dgw, it’s gotta be Aguero though surely as Man City will go full pelt as they need to win the league, thoughts? Wait to see how the champs league unfolds. It looks like Aguero is struggling with an injury. If he plays 90+ against spurs, I’d be wary of giving him the arm band. Regardless of FPL, if Brighton beat Cardiff on Tuesday, would everyone agree that's relegation sorted? Basically if Cardiff lose Tuesday, they'll need 3 wins out of their 4 remaining games, and hope Brighton lose all 5 of their remaining games. Not sure if this becomes a good thing for the teams playing them, and also the other teams near the bottom, like Southampton, will they play with a little more freedom now safety is basically confirmed. B - Kane will not play for at least 4 weeks IMO. IF he does make it back at all for this season, it won’t be in the next 3 GW’s. This article is clutching.....managers can’t change their Brighton selections now! You leave Seagull poo on your car bonnet long enough and it will burn through to your engine. Is this like when the seagulls follow the trawler?! Arnie has to go, Deeney my 1st choice. Any other thoughts?